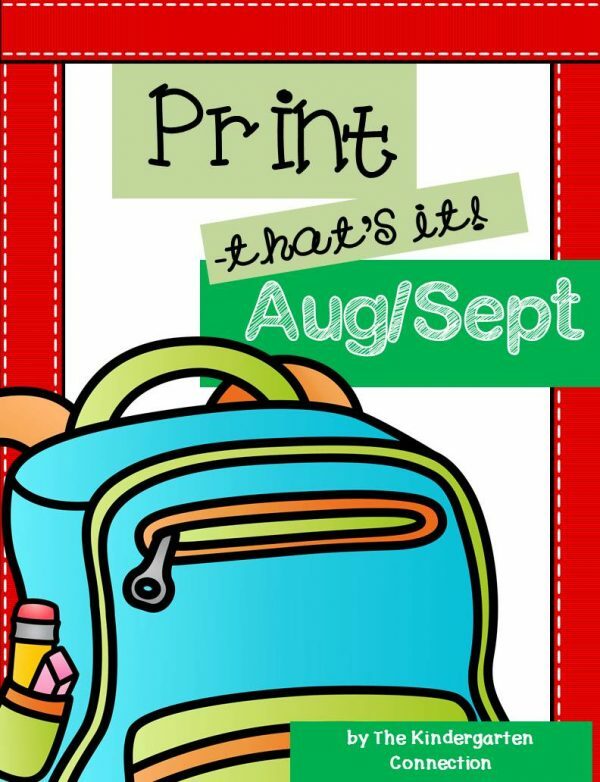 This is the Back to School pack in a monthly series called “Print – that’s it!” It contains printable math and literacy activities that are little to no prep and are geared toward beginning kindergarten students. 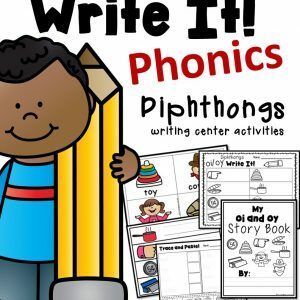 Letters in my Name – Color the apples that have a letter that is in your name. 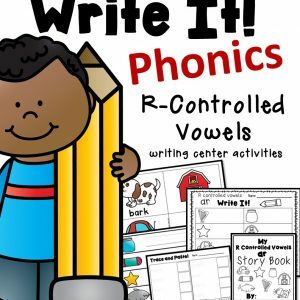 Spin, Read, and Color (7 pages, each letter represented and common reversals like b and d are reviewed on the final page) Using a paperclip and a pencil, spin the spinner and read the letter. Find and color an apple with that letter. Apple Trees (2 pages) Read the numbers on the tree trunks. Draw that many apples on the tree. Ten Frame Stories – Read the numbers on the books. Fill in the ten frames to match. Count the Dots – Count the dots on each ten frame. Write the total on the glue bottle. 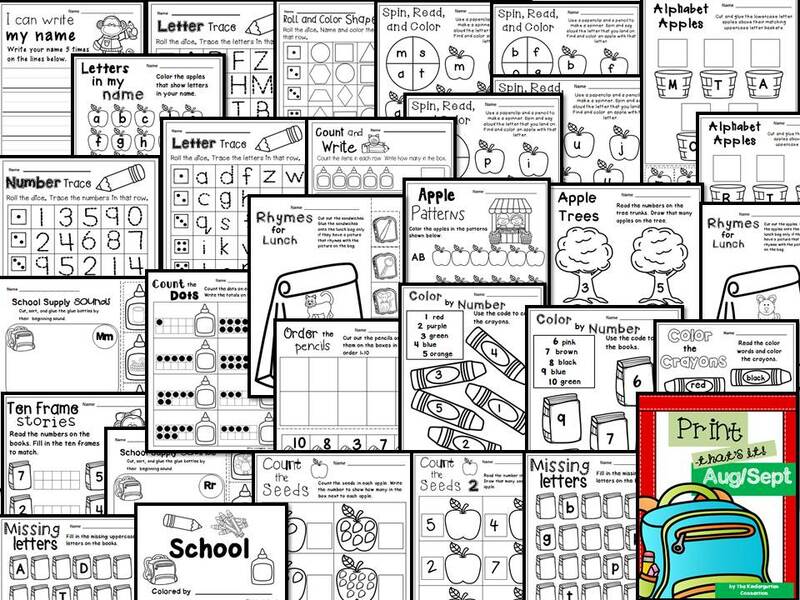 Rhymes For Lunch (2 pages) – Cut out the sandwiches (apples on 2nd page) and glue onto the lunch bag only if they rhyme with the picture shown. Draw the Seeds – Read the number in the box. Draw that many seeds on the apple. 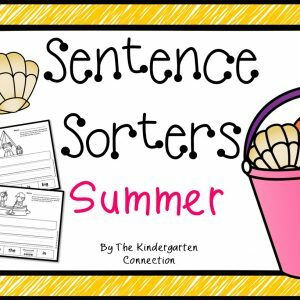 Emergent Reader – “School” Contains seasonal themes. Simply print 2 sided, cut in half and staple! 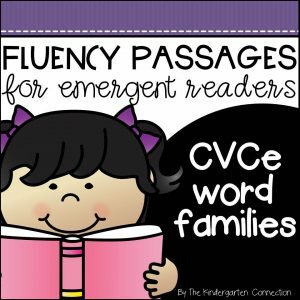 This book is for very early readers and contains one word/label per page to show school items.